Announcing our headliner - Stay Layne Matthews! KUTZTOWN, Pa., March 30 – Allies of Kutztown University will present its annual Allies Drag Show on Thursday, April 5, at 7 p.m. in Schaeffer Auditorium. This year’s show, sponsored by the Association of Campus Events, will feature Alyssa Edwards and special guests Elektra Fearce St. James, LeKross DeAire and Aida Stratton. The show will also feature many other professional and student drag performers. The event is open to the public. All donations collected at the event will benefit Valley Youth House and Lambda Legal. Alyssa Edwards is the stage name of Justin Johnson, an American drag performer and choreographer from Texas. He is best known for being a contestant on Season 5 and All Stars 2 of RuPaul's Drag Race. Elektra Fearce St. James is from Bethlehem, Pa., and was Miss Gay Pennsylvania 2009 and East Coast All American Goddess 2017. Valley Youth House provides homes for vulnerable, abused and homeless youth, partnering with thousands of individuals to build a solid foundation for young people and their families. For more information on this event please contact Christine Price, director of the KU LGBTQ Resource Center, at price@kutztown.edu or 610-683-4655. This Saturday, March 24th students from all over the country are marching in Washington, D.C. for the “March for Our Lives” to improve school safety and reform gun laws. This does not just affect the students in schools but everyone including those at concerts, night clubs, churches, malls, etc. In reality there is no safe place. Remember Pulse Night Club! Sadly, the American Flag seemly flies at half-staff following each tragic multiple event more than fling full staff, it’s a sad tribute to our society. This does not include the 96 Americans a day average that are murder victims of domestic violence, robbery and other violent crimes with guns. So what we claim to use as protection can also be used as a murder weapon. Like all things licensed there are rules and regulations to make it safe. One is licensed and registered to drive a car, a doctor to practice medicine, a lawyer to practice law, and yes, you need one to fish and hunt. Each area is regulated and if you do not follow the rules, you lose the privilege. These students are taking on a fight that the rest of us has been complacent of, that is calling out the gun lobbyist and the politicians that have accepted “30 pieces of silver” to support gun lobbyist views. A single life is worth much more than what gun lobbyist paid out 419 million of dollars to many elected officials and campaign advertising last year. After each horrific violent event, the call for preventive action fell on deaf ears of many elected lawmakers. This time is different, the students organized, even defying some school officials who tried to prevent the right of free speech instead of providing a lesson in civics. No one wants to take away the Second Amendment, but the military weapons of war should be used only for war, and ownership of guns need better licensing procedures and regulations. “ENOUGH IS ENOUGH!” On Monday, March 19th at the General Meeting of the Reading PRIDE Celebration voted unanimously to support the students and encourage members of the LGBTQ community to also “March for Our Lives” in solidarity and support of the students who also feel disenfranchised. Why just last year, the Rand Corporation at the request of the former Secretary of Defense reported an estimated 1,320 to 6,630 transgender people serve on active duty out of 1.3 million armed forces members and another 830 to 4,160 in the reserves. Nearly two dozen other countries allow transgender people to serve in their armed forces including Australia, Canada and the United Kingdom. The report also states health costs would increase only between $2.4 and 8.4 million annually which is just a fraction of the estimated $32.3 billion budgeted for the armed services health care programs. It was estimated that only 130 transgender people a year would seek gender reassignment surgery. I am unsure what President Trump means about “disruption” since I believe that most soldiers and sailors would not question the expertise of a fellow serviceperson, especially one that has your back. The disruption comes when military loses qualified medical personnel, translators, chaplains, officers and combat ready personnel. This is what disrupts our ability to be an effective military power. We would be amiss if we didn’t look at why the LGBTQ+ community continues to be victimized in this day and age? Is it possible that the community is complacent by not recognizing how important guaranteed protections are vital to every American citizen? If you have not experienced the fear of or discrimination itself then you might not feel a need to speak out or to take action. An example is on June 11th; we tried to fill a bus for the National Pride March in Washington, D.C. and could not even muster enough people for half a bus. Greater Reading was represented by a few who decided to drive to the rally. The LGBTQ+ community wants to celebrate their diversity and unity with the rest of the community at Pride events all year but where are you when it comes time for the festival, events and programs? By using Pennsylvania’s estimated percentage of LGBTQ+ people of 3.6% and apply it to Berks County’s overall Population (2015) we are 14,950 potentially strong. Not even 10% of the LGBTQ+ community attends or supports Pride in celebrating who you are in a safe place. 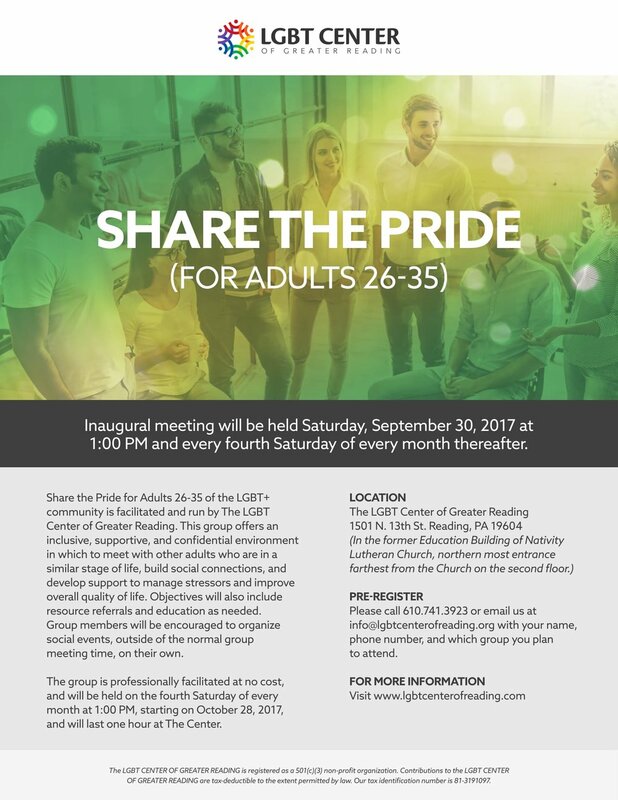 Now we have The LGBT Center of Greater Reading which has developed partnerships with agencies and organizations, providing support groups, educational and advocacy programs. Without you we cannot maintain or create the services, programs and events you want and need. The time for A CALL TO ACTION is now. You and the LGBTQ+ community can become a political force in Greater Reading by registering and voting so that we do not lose the gains we have made over the past years. Become the advocate by responding to advocacy organizations request to call, send emails or write letters to politicians, organizations and businesses that need to know where you stand in promoting your community’s civil rights, those enjoyed by other American citizens. You are part of the LGBTQ+ community or an ally, step up and be comfortable with who you are. Many of us shared and know the difficulty of coming out, keeping secrets, feeling alone and fear of others finding out who you really are. Just remember, most of us were there and we can tell you it can be one of the most freeing moments of your life. 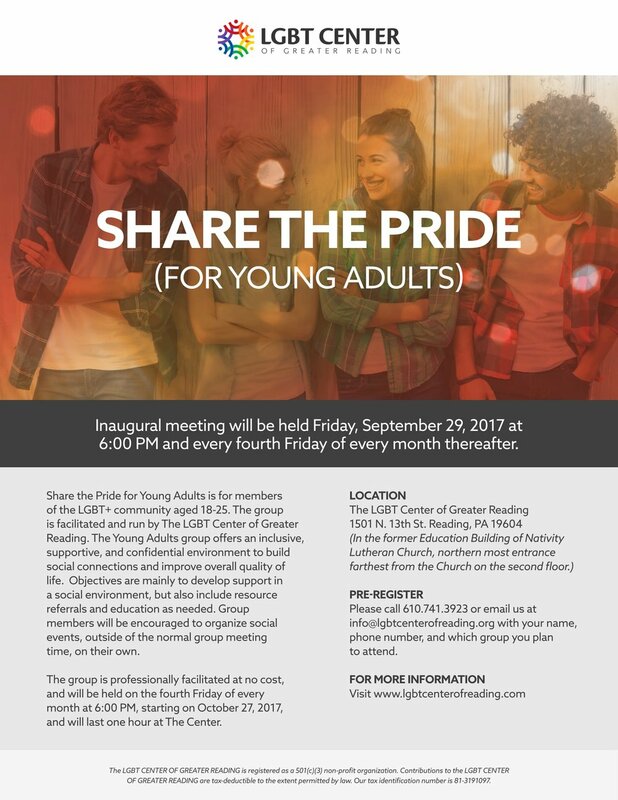 Need support, there is a whole community out there for you including Pride and the Center. We do wish to thank those who are active and support our community. You are the backbone of keeping us LGBTQ STRONG! On August 16th, the Reading Fightin’ Phils will host the 5th Annual LGBTQ Night at First Energy Stadium, a stadium that seats 9,000. There are enough of us to fill the stadium plus. It’s not just about baseball, it’s about community! Let’s support the Reading Phils and show Greater Reading that we are LGBTQ STRONG!